Oil-Based Paint Poisoning is the accidental or intentional intake of the compound. What is Oil-Based Paint Poisoning? Oil-Based Paint Poisoning may be also referred to as Oil-Based Paint Toxicity. What are the Causes of Oil-Based Paint Poisoning? What are the Signs and Symptoms of Oil-Based Paint Poisoning? The signs and symptoms of Oil-Based Paint Poisoning can vary from one individual to another. It may be mild in some and severe in others. Several systems of the body, such as the vascular system, digestive system, respiratory system, nervous system, and ENT may be affected. How is First Aid administered for Oil-Based Paint Poisoning? Who should administer First Aid for Oil-Based Paint Poisoning? 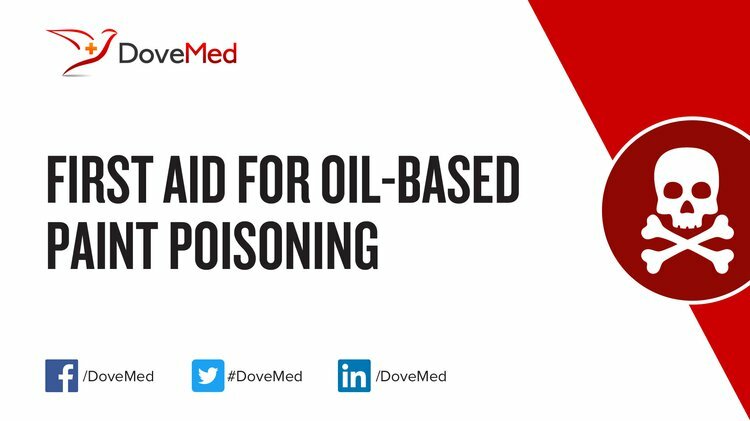 First aid for Oil-Based Paint Poisoning is administered by healthcare professionals. What is the Prognosis of Oil-Based Paint Poisoning? How can Oil-Based Paint Poisoning be Prevented? Kareru, P. G., Keriko, J. M., Kenji, G. M., & Gachanja, A. N. (2010). Anti-termite and antimicrobial properties of paint made from Thevetia peruviana (Pers.) Schum. oil extract. African Journal of Pharmacy and Pharmacology, 4(2), 087-089. Bailey, H. D., Milne, E., De Klerk, N. H., Fritschi, L., Attia, J., Cole, C., & Armstrong, B. K. (2011). Exposure to house painting and the use of floor treatments and the risk of childhood acute lymphoblastic leukemia. International journal of cancer, 128(10), 2405-2414. Abdullayev, E., & Lvov, Y. (2010). Clay nanotubes for corrosion inhibitor encapsulation: release control with end stoppers. Journal of Materials Chemistry, 20(32), 6681-6687. Missia, D. A., Demetriou, E., Michael, N., Tolis, E. I., & Bartzis, J. G. (2010). Indoor exposure from building materials: a field study. Atmospheric Environment, 44(35), 4388-4395. Konwar, U., Karak, N., & Jana, T. (2012). Vegetable oil‐based highly branched polyester modified epoxy based low VOC high solid industrial paint. Journal of Applied Polymer Science, 125(S2). Gottesfeld, P., Kuepouo, G., Tetsopgang, S., & Durand, K. (2013). Lead concentrations and labeling of new paint in Cameroon. Journal of occupational and environmental hygiene, 10(5), 243-249. Calvano, C. D., Van der Werf, I. D., Palmisano, F., & Sabbatini, L. (2011). Fingerprinting of egg and oil binders in painted artworks by matrix-assisted laser desorption ionization time-of-flight mass spectrometry analysis of lipid oxidation by-products. Analytical and bioanalytical chemistry, 400(7), 2229. Qian, H., Fiedler, N., Moore, D. F., & Weisel, C. P. (2010). Occupational exposure to organic solvents during bridge painting. Annals of Occupational Hygiene, 54(4), 417-426.